• Sheehan: My son "did indeed die for nothing"
(CNN) -- Cindy Sheehan, the California mother who became an anti-war leader after her son was killed in Iraq, declared Monday she was walking away from the peace movement. She said her son died "for nothing." Sheehan achieved national attention when she camped outside President Bush's home in Crawford, Texas, throughout August 2005 to demand a meeting with the president over her son's death. While Bush ignored her, the vigil made her one of the most prominent figures among opponents of the war. She wrote that she is disillusioned by the failure of Democratic politicians to bring the unpopular war to an end and tired of a peace movement she said "often puts personal egos above peace and human life." Casey Sheehan, a 24-year-old Army specialist, was killed in an April 2004 battle in Baghdad. His death prompted his mother to found Gold Star Families for Peace. But in Monday's 1,200-word letter, titled, "Good Riddance Attention Whore," Sheehan announced that her son "did indeed die for nothing." "I have tried ever since he died to make his sacrifice meaningful," she wrote. "Casey died for a country which cares more about who will be the next American Idol than how many people will be killed in the next few months while Democrats and Republicans play politics with human lives. "It is so painful to me to know that I bought into this system for so many years, and Casey paid the price for that allegiance. I failed my boy and that hurts the most." 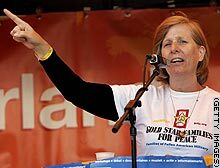 Cindy Sheehan's sister, DeDe Miller, told CNN that the group would continue working for humanitarian causes, but drop its involvement in the anti-war movement. As for her sister's letter, Miller said, "She cried for quite a bit after writing it." Sheehan warned that the United States was becoming "a fascist corporate wasteland," and that onetime allies among Bush's Democratic opposition turned on her when she began trying to hold them accountable for bringing the 4-year-old war to a close. In the meantime, she said her antiwar activism had cost her her marriage, that she had put the survivor's benefits paid for her son's death and all her speaking and book fees into the cause and that she now owed extensive medical bills. "I am going to take whatever I have left and go home," she wrote. "I am going to go home and be a mother to my surviving children and try to regain some of what I have lost. "I will try to maintain and nurture some very positive relationships that I have found in the journey that I was forced into when Casey died and try to repair some of the ones that have fallen apart since I began this single-minded crusade to try and change a paradigm that is now, I am afraid, carved in immovable, unbendable and rigidly mendacious marble." Cindy Sheehan wrote in an online diary that she is walking away from the anti-war movement that made her famous. Do you agree with Cindy Sheehan that her son, who was killed in an April 2004 battle in Baghdad, died "for nothing"?